On Friday I was picked-up by the DTU team at Qaanaaq airport with their workhorse Twin Otter plane. It was a beautiful sunny day and we put it to good use. Instead of flying to Alert along the coasts of Greenland and Canada, we headed directly up onto the Greenland ice cap then turned north and flew along a CryoSat track acquired on the previous day. The transition from the glacier and onto the Greenland ice cap (left part of the photo). The plane is flying at about 300 m.
The transition from sea level to the ice cap itself is spectacular, often consisting of a succession of deeply crevassed glacier fronts. 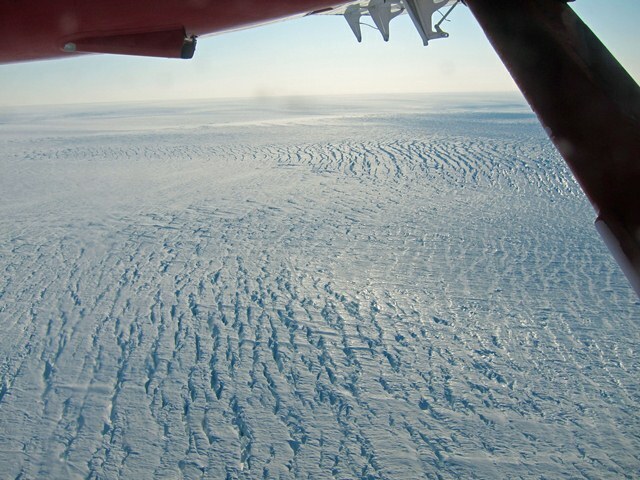 The ice cap itself is much less so, especially after a few hours of flying since, apart from some patterns owing to snow drift, it is mostly featureless. Still, it inspires awe in terms of its sheer size and extent, and it is easy to get a mental picture of the mind-boggling amount of water locked up in the ice below. The Canadian military base Alert at the northern trip of Ellesmere island. 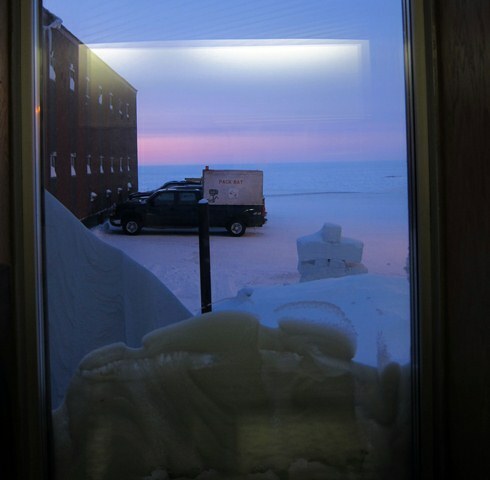 We finally made it to the military base of Alert, Canada on Friday evening where the teams have now spent two days analysing the data acquired so far and making plans for today (Monday). 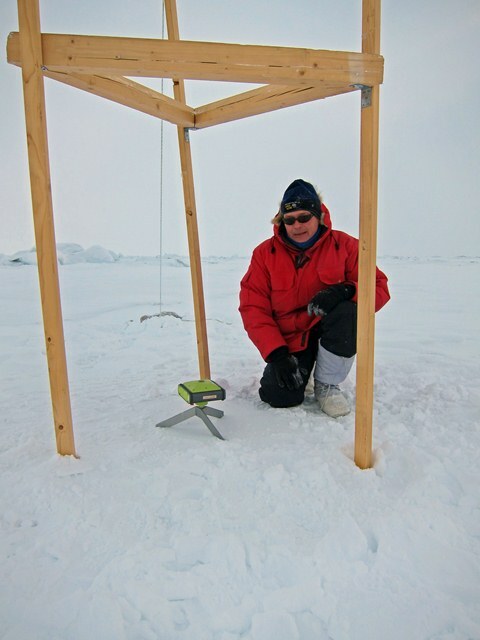 Rene Forsberg from DTU making a GPS position measurement beneath a corner reflector placed at the end of the runway on Sunday. Three, or maybe four, planes filled with scientific sensors to measure ice conditions below will head to a meeting point slightly to the east of the Alert base and then collectively head north as CryoSat crosses high above them. Conditions are cold (–27°C) and clear, which is perfect. More to follow – but the plane is waiting ! 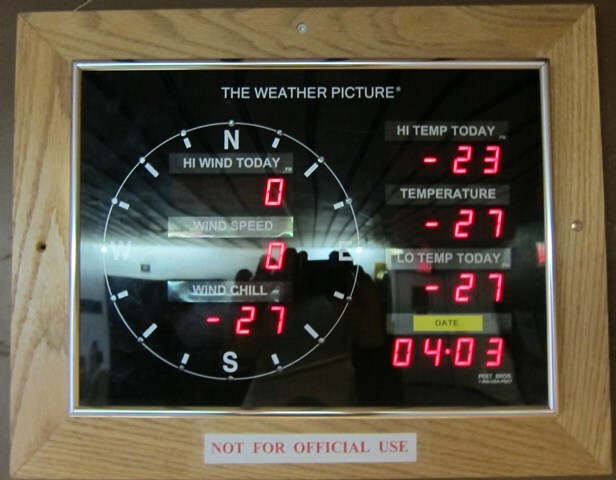 The temperature this morning as we prepare for the joint ESA and NASA flights.